The boardwalk at Magee Marsh Wildlife Area has become an iconic birding destination. Birders from around the world consider it one of the best places in the Western Hemisphere to experience the spring migration of songbirds. The area of wooded habitat along Lake Erie that the mile-long boardwalk meanders through is a concentration point for birds as they pause to rest and feed before crossing the Lake. And because the birding is so sensational, the boardwalk can become quite crowded at times. Black Swamp Bird Observatory, in conjunction with Ohio Division of Wildlife and local birders and photographers, has developed a simple Boardwalk Code of Ethics to help ensure that your time on these bodacious birding boards is an enjoyable experience. Please note that since Magee Marsh is a state wildlife area, there are some regulations governing activities that are punishable by law. We list a few particularly important examples below. The remaining information we offer simply as suggestions to make your experience a positive one and to ensure that the birds and the habitat are respected and protected. Littering is prohibited. There are NO TRASH RECEPTACLES near the boardwalk, so the Pack In - Pack Out rule applies. To injure, remove, deface, damage, or destroy any tree or plant on state property is prohibited. No soliciting of any kind without a written permit from the Ohio Division of Wildlife. Other than assistance animals, pets are not allowed on the boardwalk. Scattering or placing feed capable of luring, enticing, or attracting birds is prohibited. Camping, swimming, fires, barbecuing in the area is prohibited. So others can enjoy the natural experience, refrain from using radios, shouting, or making other loud noises. Turn cell phones off or set to vibrate. 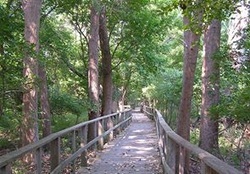 Respect the habitat and protect the resource by staying on the boardwalk at all times. For the safety and comfort of others, please don’t block the boardwalk in any way. Be aware of your personal space and how it impacts others (i.e. backpacks, tripods, strollers, etc.). Be mindful of those around you and allow others to pass in congested areas. Do not stand or sit on the railing of the boardwalk at any time. Please be considerate of the experience of those around you and do not smoke. Please keep in mind that whether birding, photographing, or just enjoying a walk on the boardwalk during migration, we are all there for the same ultimate reason. Please be respectful of one another, enjoy the birds and company, and rejoice that there are so many people with varied interests who care for nature. The #1 complaint we receive about the Magee Boardwalk experience is the use of tripods. Tripods can be a challenge for everyone when the boardwalk is crowded. During these times, we encourage the use of monopods, or photographing birds along the edge of the parking lot where bird photography can be really good! If you do use a tripod on the boardwalk, set up in such a way that you utilize the smallest area possible, try to avoid occupying more than ½ the width of the boardwalk. Laser pointers: We discourage the use of laser pointers at all times. Pishing, squeaking, playback, and other bird-attracting sounds are discouraged. They're not likely to be effective anyway: migrants passing through an area tend to be less responsive to such sounds, while resident birds at a popular spot like Magee have become habituated and mostly ignore these sounds. This is mentioned in the first section under state regulations, but worth repeating: Do not alter the habitat in any way (breaking branches, pulling vegetation, etc.) in order to get a better view or photo of a bird, bird nest, etc. Share the view: Once you see the bird, move on and allow others to enjoy it. When viewing a bird, please step as close as possible to the railing on the side the bird is on to allow others to pass safely behind you. Whenever possible, avoid walking in front of someone who’s looking through optics or camera. Flash photography: In areas where there are crowds of people and the birds are close, we discourage the use of flash photography on the boardwalk. Exercise patience with beginners. The boardwalk attracts many new birders who may not know basic birding etiquette. All of these people represent potential new support for bird conservation, so it's very important to treat them with patience and courtesy. Restrooms: It’s a long way to the other end of the boardwalk, and the birding can be so good that hours will pass before you know it. To ensure your comfort and happiness, we encourage use of the portable toilets before entering the boardwalk. Food: While there are many wonderful restaurants in the area, the boardwalk is a fair distance from them, so packing a picnic lunch can be a good option. Carry water with you at all times. On average, spring migration in northwest Ohio happens before the hatch of biting insects, so repellent is typically not necessary. The Magee boardwalk is in a fairly remote location, at least 35 minutes from the nearest hospital. It's a good idea to carry a small first-aid kit when birding the area.